The story of a coat. . . . 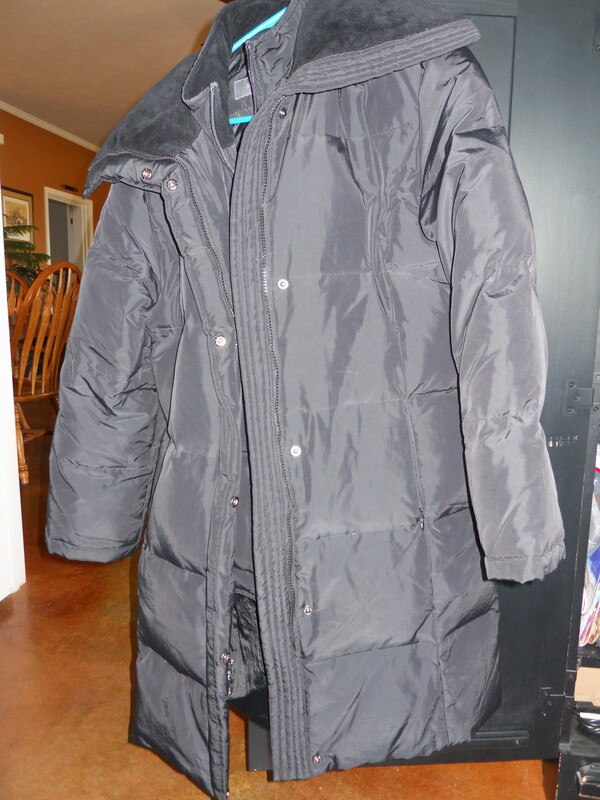 There it is, a rather unremarkable Liz Claiborne, down-filled car coat with fleece lined collar, black in color. It keeps one quite warm in the frigid winters that we are reluctantly becoming accustomed to here in Arkansas. We are becoming used to them because of the introduction of “polar vortex” and “arctic blast” into the vocabulary of our local meteorologists. This coat may look somewhat nondescript, and that quality is central to this story, which is (unfortunately) all-too-true. The reader may be aware that a couple of weeks ago we experienced here in the mid-south the rapid and brutal cooling that follows the path of an arctic front that dipped unusually deep into the heart of our great country. I doubted the predictions and left for work early one morning clad only in my usual long-sleeve undershirt, scrubs, and a fleece jacket. Mid-morning found me impressed enough by the frigid temp as I left the hospital to drive across town to the clinic that I called my sweet, always-willing to help husband and asked him to bring my heavier down coat from the closet to me. He delivered it to the clinic while I was seeing patients, and my return trip to the hospital was oh-so-much more comfortable! Thank you, sweetheart! That afternoon everything was harder than it should have been. Procedures that should have taken 45 minutes took 90. The procedure that should have taken an hour took almost three. There was an extra procedure added on. Suffice it to say that when I finally left the hospital, I was very glad to be doing so. I drove toward home in a state of exhaustion. All I wanted was a quick bite to eat, my pajamas, a rerun of Castle while holding my husband’s hand, and deep, dreamless sleep. That’s what I wanted. However, I generally check on my 88-year-old mother on my way in–her house is about a mile before ours–and this day was a day for a face-to-face visit. It would be a quick one, I vowed to myself. And, it was. She assured me her arthritis was not acting up too badly and the psychotic cat (that she loves dearly) was in a mellow mood. She bemoaned the fact that Thursday night TV was just unacceptable. I agreed, hugged her, and said good night. As I approached my vehicle, I pulled a set of keys from my pocket and began pressing the “clicker” to unlock the door. No headlights flashed. I pressed the lift-gate button. Nothing. I pressed the panic button. No horn sounded. What could be wrong? I guessed the thing had batteries. I tried to open the door lock with the key, but couldn’t get it to work. After a couple of minutes of futile attempts, the wind biting the exposed skin of my face, I reentered Mom’s warm house and called my husband, for the second time that day, asking to be rescued. Soon I saw the lights of his truck and went out to show him how the stupid “clicker” wouldn’t work. And, I am just so tired, I complained. Did you bring your extra set? I couldn’t even get the key to open the door. See? And I pulled a set of keys from my pocket and pressed the door lock button, and headlights flashed and the door unlocked. I stood in stunned disbelief. Just a short while ago–but, wait. Those first keys–were they different, somehow? Reaching into my pocket again, I pulled another set of keys from it. Oh, no! I had swiped somebody’s keys! I must have picked them up unthinkingly. One of my co-worker’s is stranded at work on this awful night. And, no, I don’t feel like figuring it out, but I’ve got to………. Once again, my knight in shining armor steps in to rescue me, his dramatically distressed damsel who was alternately in a state of panic or whining about what a terrible day it had been already and I was just too tired to deal with it. I called the only physician left in the cath lab at that late hour. Yes, she was sure she had her keys. I finally obtained the numbers of all the cath lab team that had finished the day with us. They were home and had driven themselves home. Sure, they had their keys. My husband and I drove to the clinic to see if anyone seemed to be stranded there. Nope. All appeared well. Lot empty except for cleaning staff. My shoulders slumped. My head throbbed. It’s no use, I murmured, near tears of frustration. Go home. I’m out of ideas. And, we did. Drive home, I mean. And I ate something–I can’t remember what. And donned my PJs. But no Castle, I said. Bed for me. And, somehow, I slept. Awakening the next morning, I was immediately aware that the key mystery remained unsolved. I readied myself for work. It was still freezing cold, and I donned the black coat. It was only as I was sitting in the driver’s seat glaring at the mystery keys which accused me from the console, that I really looked at this coat that had hung in my closet for almost a year between wearings. Somehow the fabric of the coat was not quite as shiny as I remembered. It really didn’t look the same at all. And, didn’t my coat have a zipper closure and snaps? This one has toggles?! And the cuffs are different! I became suddenly aware of the humiliating truth. I had not only swiped someone’s keys. I had stolen her coat. Granted, it resembled mine. But I HAD KEPT IT ALMOST A FULL YEAR–EVER SINCE THE LAST ICE STORM LAST WINTER!!! The mystery was soon solved. I routinely hung my coat in the nurses breakroom on 2North, where I daily entered the hospital.Today I held the coat in question up for all to see. Does anyone recognize this coat? I somehow have the wrong coat. And these keys were in the pocket. The charge nurse exclaimed that she did remember that last year one of the nurses had searched in vain for her coat after staying at the hospital for three days during that last big ice storm. And she had had to have her car rekeyed. Had feared it stolen, as a matter of fact. She took me to the manager, who verified the story and contacted the victim, who, of course, is the daughter of a dear couple, her mother a former co-worker. (Let’s just magnify the humiliation and mortification by making the victim someone you really like and whose family you know.) As a matter of fact, the manager said, your coat is still hanging in the breakroom. We’ve wondered who it belonged to. So, I now have my coat. She has hers. I have apologized excessively. She has been only too gracious. She did say that my coat hanging in the breakroom began to bother her through the summer. After all, her coat was missing and someone didn’t even care enough to take theirs home. It just reminded her of her loss. So, there ends the mystery of the coat and keys. But another mystery remains. A friend of mine insists that there should be a lesson to learn from this. That all such embarrassing moments that so prove our imperfection as human beings should be used to make a point, to illustrate a sermon, to teach a truth. There should be a moral to the story, so to speak. I confess that the lesson escapes me, at least for the moment. Previous postA tribute. . . .
Next postHoliday passages . . . .